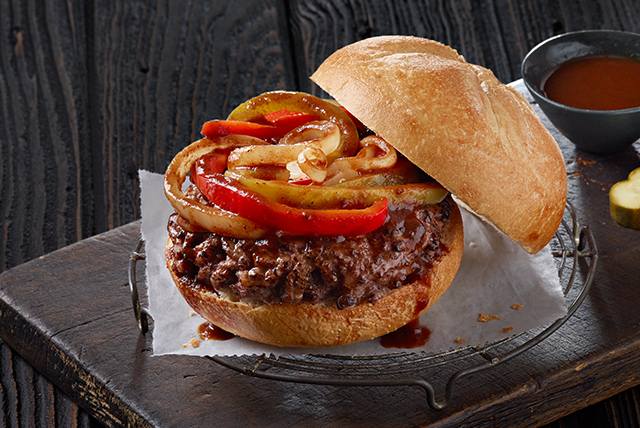 Serve up this hero sandwich-inspired Pepper and Onion Burger at your next cookout. The fun doesn't stop with the grilled veggies, however. The Pepper and Onion Burger also features the added kick of A.1. Original Sauce! Place peppers and onions in center of large sheet heavy-duty foil; drizzle with 1/4 cup steak sauce. Fold to make packet. Grill 2 min. Meanwhile, mix meat and 2 Tbsp. of the remaining steak sauce; shape into 4 (1/2-inch) patties. Grill 8 to 10 min. or until vegetables are crisp-tender and burgers are done (160ºF), turning burgers after 4 min. and brushing with remaining steak sauce. Remove packet from grill; cut slits in foil to release steam before opening packet. Fill rolls with burgers and vegetables.